RESULTS: Efe Ajagba Scores 0:1 Second Win Over Curtis Harper - Video! 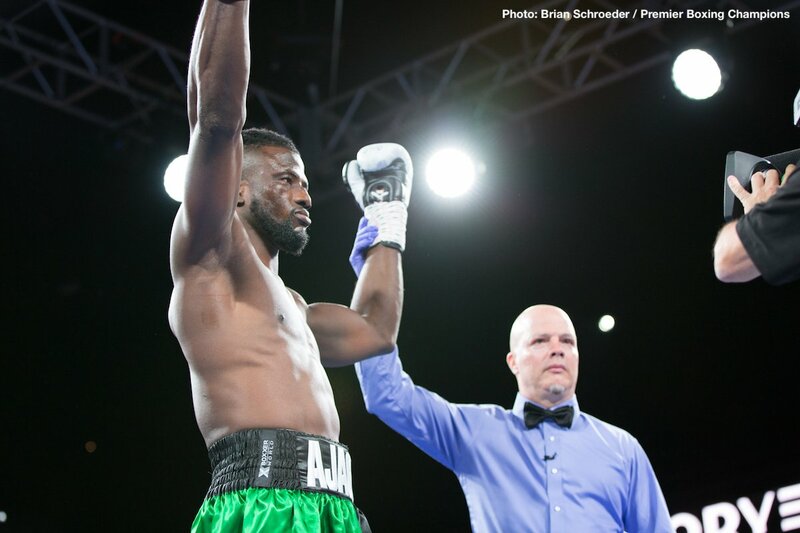 RESULTS: Efe Ajagba Scores 0:1 Second Win Over Curtis Harper – Video! Bizarre is the only word fans could use to describe the “action” between heavyweights Efe Ajagba and Curtis Harper. Fighting last night in Minneapolis, unbeaten Nigerian Ajagba figured to get a test from the 12-6(9) Harper. Instead, he got nothing – apart from one huge shock. The two fighters touched gloves and were given the traditional pre-fight instructions from the referee, the bell rang for round-one – and then Harper was gone, as in gone from the ring, from the arena! The official result, one that left Ajagba and fans and experts in attendance bemused, goes down as a disqualification win for the now 6-0(5) 24 year old who is based in Texas. Harper falls to 13-6(9). The word is, the reason for Harper’s weird antics was the fact that he wasn’t getting paid as much as he felt he should have been and he therefore made a “statement.” You can file this one under the ‘just when you thought you’d seen it all’ dept. Harper, a good fighter who showed plenty of heart and guts when he rumbled with contender and former world title challenger Chris Arreola back in March of 2015, may well have seen his career come to an end after this stunt. Of course we’ve seen fighters quit before, but never before a single punch has even been cocked, let alone thrown! It’s hard to not have sympathy for Ajagba, a young and ambitious fighter who trained hard for what, on paper at least, might have been his toughest test. All the Harper fight turned out to be was one big, big waste of time, for Ajagba, for Harper and for the paying fans. In no surprise, many fans have taken to social media to thoroughly lay into Harper for his actions. Many fans have flat out called Harper a coward (this he is not, despite last night’s craziness; Harper showing this in previous hard fights), while others are calling for him to get slapped with a lifetime ban from the sport. It sure would be interesting to get Harper’s take on why he did what he did. You are here: Home / Boxing News / RESULTS: Efe Ajagba Scores 0:1 Second Win Over Curtis Harper – Video!